I had a relaxing dinner at a local Mexican restaurant tonight with some friends. The cool, dry breeze blowing off the lake was a welcome relief after Rome’s blast furnace heat and high humidity. During dinner, discussion naturally centered around the big news of the day–the Kennedy plane crash. Somehow we ended up on the topic of air traffic control. I asked if anyone remembered the PATCO strike in the early 80’s. No one did. I shouldn’t feel bad, because it’s probably not an age thing. I remember the strike well, but for a different reason: I was there. When I moved to Alaska in 1982 to live with some family, my cousin Dave was in working at the Anchorage enroute air traffic control center (aka “Anchorage Center”). The Center controls a lot of the traffic in the Pacific. The next closest Centers are in Seattle and Tokyo. The actual Anchorage Center building is a large windowless structure sitting on the edge of Elmendorf Air Force Base. Even in the early 80’s the equipment had a antiquated feeling–you could almost smell the electronics slowly cooking themselves. Anyway, Dave was working there as a controller. He was hired after President Regan fired all the controllers who went on strike as part of the PATCO union. Even with the new personnel hired to replace them, the nation’s air traffic control system was extremely understaffed. I was in 6th and 7th grade during that time, and just for fun I used to go in to work with Dave on occasion, usually on a Friday night. 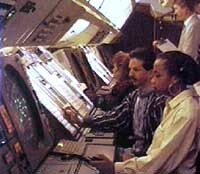 Oftentimes I’d help out in the Flight Data section, functioning as the “runner”. The runner’s job was to make sure the aircraft data strips which came off the printer were delivered to proper controllers for each sector. There were even a few times when Anchorage Center was so understaffed that I, at the age of 11 years old, would sit at one of the controller’s stations and watch an area known as Sector 12. Sector 12 was fairly close to the North Pole, and was traveled only by the occasional jumbo jet flying the “Great Circle” route from one side of the world to the other. The sector was often empty, so I’d sit there and wait for something to show up on the screen. When it did, I would call one of the guys over and they’d take care of it. It sounds sort of surreal to write about it in today’s highly litigious world, but back then nobody seemed to mind–the stuff I did was fairly brainless. I can still recall the large green scope, keyboard, and trackball. When I’d get tired, I would nap in the lounge or tune in a funky new station called MTV or watch Friday Night Videos on a small television mounted high up in a corner of the room. There were some exciting moments, like the time that Korean Airlines flight 007 was shot down by a Russian fighter, but typically the place was quiet and business like. Not exactly part of your stereotypical childhood, was it? Nevertheless, it’s one of those things I look back on fondly.